This 1906 John Holland has an unusual filling mechanism. A model 52 “Pull-Filler” in gold-fill Repousse on BHR. Circles of high repousse roses on an etched “bark” background. Exquisitely beautiful! Sometimes called the “saddle-fill”, since it’s a saddle shaped device the user lifts to fill the pen. 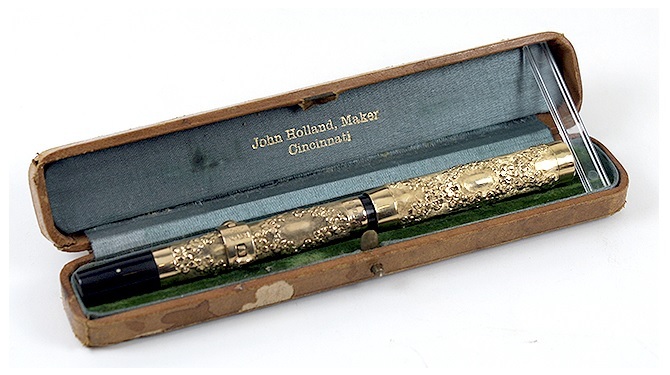 Holland claims to have started fountain pen manufacture in 1865, and introduced this particular filling mechanism in 1906 (a year after they introduced their “sleeve-fill” pens), and used it until 1918. George Parker was a Holland distributer until he started his own pen company by improving on the Holland feed! This specimen has a medium/fine, extra-flexible nib. Near mint in original velvet lined, brown leather box (box shows wear). This pen is available from Catalog #74 for $2000. This entry was posted in Vintage Pens and tagged Extraordinary Pens, John Holland. Bookmark the permalink. Follow any comments here with the RSS feed for this post. Post a comment or leave a trackback: Trackback URL.